“Let’s take a bite out of crime.” We’ve all heard that slogan. I was never sure if it meant that we should do what we can to diminish criminal activities or that we should decriminalize biting. People are funny about biting offenses allegedly committed by dogs. They are understandably quick to vilify a dog who, without provocation, attacks a person or someone’s pet. The offending dog is quarantined and sometimes destroyed, and the dog’s human companion may be subject to prosecution and/or civil liability. But folks are quick to forget the vast number of dogs wrongly accused of biting. My dad is ashamed to admit that when he was a child, he bit his infant brother on many occasions because he believed his brother was a hideous alien monster (to this day, he still has doubts). Dad always blamed the bites on the family dog. His parents took my dad’s word over the dog’s, even though the elderly dog had no teeth (his parents had the investigatory and reasoning talents of garbanzo beans). So, my dad skated and the beleaguered dog always wound up in the dog house. When the dog died of infectious false accusations, my dad came clean and admitted the truth to his father. His father’s response? “Who cares? Go take the trash out.” Immortal injustice!! On April 26 of this year, a woman in Chicago bit her dog repeatedly. Was the lady quarantined or destroyed? Hardly. She will plea bargain down to misdemeanor inappropriate display of affection and be sentenced to limiting her biting only to weekdays. The scales of justice require a little recalibration. That’s a cause I could really sink my teeth into. Meanwhile, smart dogs will have to avoid not only humans who bite, but also those who level wild, unfounded accusations at defenseless creatures who don’t even have a biting sense of humor. 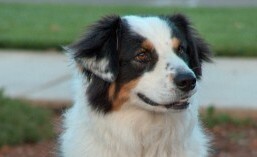 This entry was tagged aussie, australian shepherd, bite out of crime, blog, crime, dog, humor. Bookmark the permalink.